CREDIT CARD/LIPSTICK-SIZED PURSE FEATURING A LYRE, OBOE AND CLARINET (MAYBE A FLUTE!) CENTERRED ON CREAM BACKGROUND. 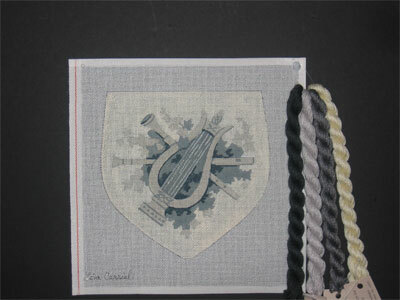 VERY SOPHISTICATED STITCHED IN GRADUATED SHADES OF GREY AU VER A SOIE OR SILK 'N IVORY (PICTURED) ON BACKGROUND OF CREAM OR BUTTERNUT SILK 'N IVORY WITH TASSEL CENTERED ON LOWER EDGE. ONE SIDED. BEAUTIFUL W/SIMPLE LITTLE BLACK DRESS.